1 - 5 $77.42 ea. 6 - 11 $75.64 ea. The McCreary AD4E4 6.00-6 six ply Aero Trainer tires are designed with your student pilot in mind. Keep your training aircraft fully-equipped for flight lessons with the specialty Aero Trainer tires. These tires are an affordable option for your flight school. Use theses tires on your single-engine training aircraft. The McCreary Aero Trainer Tires are durable enough to handle student pilot mishaps and their less-than-smooth landings. Enjoy their reliability and durability to keep your students safe during every flight lesson. Avoid risky recaps by investing in these Aero Trainer tires. These six ply tires boast the high quality our customers expect from the McCreary brand. Purchase the safety equipment your students need to practice flight at SkyGeek. For exceptional performance, the Aero Trainer Tires deliver. 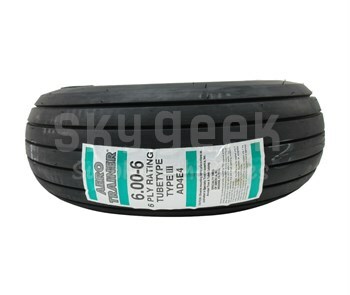 Install these McCreary AD4E4 6.00-6 six ply training tires on your single engine aircrafts. This impressive tire features excellent wear-resistance for your next flight lesson.